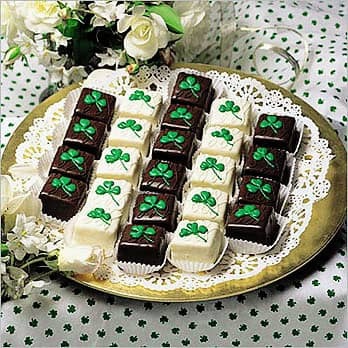 Our Shamrock Petits Fours assortment is an irresistible combination of extraordinarily rich bittersweet chocolate and refreshingly cool mint flavors. Our Shamrock Petits Fours assortment is an irresistible combination of extraordinarily rich bittersweet chocolate and refreshingly cool mint flavors. You don't have to be Irish to enjoy these enchanting cakes consisting of moist vanilla almond and chocolate layers filled with creamy mint buttercream and bittersweet truffle cream.